Scottish First Minister Nicola Sturgeon and Liberty director Shami Chakrabarti joined forces on Thursday to save the Human Rights Act, amid Tory plans to scrap it. Both ladies were previously dubbed Britain's most dangerous women. Passed in 1998 by the then-Labour government, the Human Rights Act offers protection to every resident of the UK. This protection is afforded to all, including UK citizens, foreign nationals, children, the elderly, terror suspects and prisoners. The Act empowers those whose rights have been violated in Britain to seek justice in UK courts and hold public institutions and organizations to account. Such legal recourse enables people to ensure the democratic principles of justice and equality are upheld. 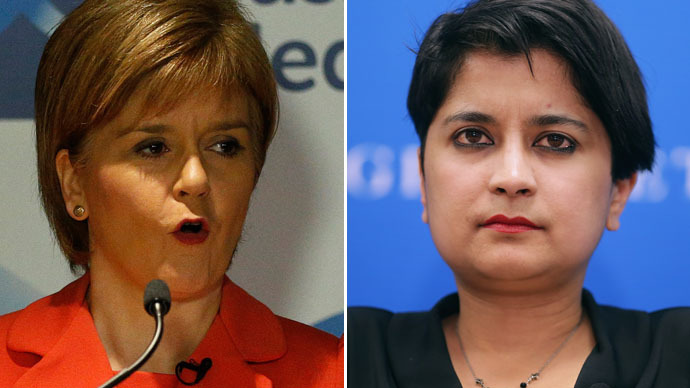 Sturgeon and Chakrabarti were previously labeled “the most dangerous women in Britain” by Rupert Murdoch’s Sun newspaper. The tabloid paper first offered the mantle to Chakrabarti, but later honored Sturgeon with the accolade during Britain’s heated general election race. Sturgeon had sparked fear among the Conservative-dominated establishment that she would help Labour into power, scrap Britain’s nuclear deterrent, challenge the Tory austerity agenda and seek to dismantle the United Kingdom. Although the two women have never shared a platform, they are now united in their goal of protecting the sanctity of human rights in Britain. Speaking on Thursday, Sturgeon praised Scotland and the wider UK’s human rights record. However, she warned those rights must be safeguarded at all costs. She said the British government should be a promoter of human rights across the globe rather than an architect of their demise. “Today’s meeting with Shami emphasized the fact that human rights are universal. They are not the preserve of any nation or any legal system – they are for all of humanity,” Sturgeon said. “I look forward to watching her continued contribution as well as that of her Westminster colleagues to promoting human rights in these difficult times,” she said. In a climate of modern slavery, mass surveillance, social cleansing, zero contract hours and rising inequality, many human rights advocates say Britain’s democratic deficit is growing. They insist the Human Rights Act is vital to cultivating a more robust, just and transparent society. Liberty was founded in 1934. It is a cross-party organization at the helm of a growing movement for rights and freedoms in Britain. The group notes both the European Convention on Human Rights and the Human Rights Act have aided Brits in improving the lives of women and their advocates all over the UK. One such woman, Patience Asuquo, traveled to Britain as a domestic worker but was plunged into modern slavery upon her arrival. Her employer reportedly seized her passport and refused to pay her. When Asuquo approached the police, her allegations were dismissed. Without the Human Rights Act, Asuquo’s case would not have been reviewed by police and her employers would not have been prosecuted, Liberty insists. Similarly, the Human Rights Act afforded justice and solace to the family of Anne-Marie Ellement. Ellement had been severely bullied in her job after her co-workers allegedly raped her. The accused were military police officers. Ellement later committed suicide. An inquest into her death failed to clarify the deeper circumstances behind her actions. However, by deploying the Human Rights Act the woman’s family secured a fresh inquest and a comprehensive investigation into the underlying factors which led to her death.